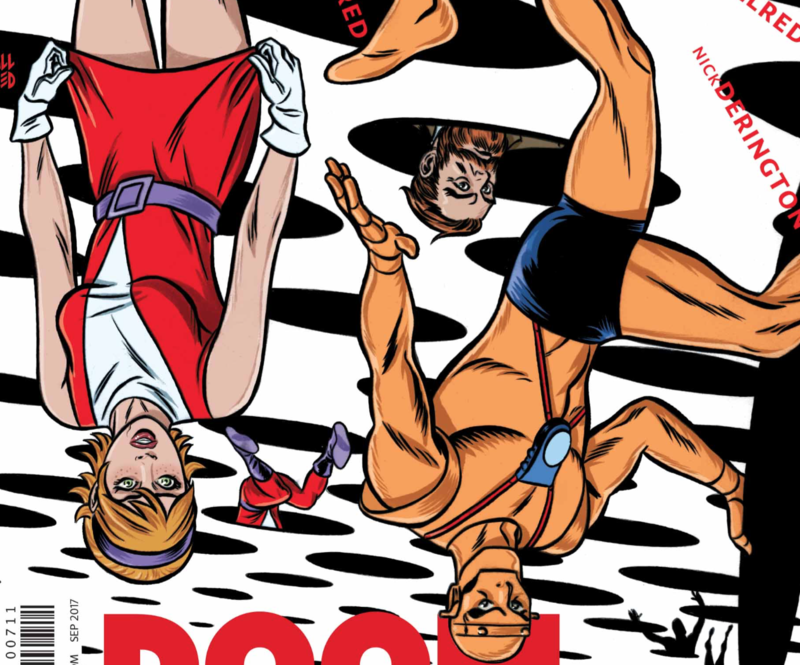 Doom Patrol #7 Review – AiPT! Way’s presentation of ‘Doom Patrol’ is wonderfully odd and truly unique. A new art team, new characters and new story arc have arrived for what is hands down one of the strangest comic books on the shelves today. Let’s jump in and find out if it’s any good. How have you been, Niles Caulder? The Chief is back, and he’s ready to reshape the new Doom Patrol to be just like the old Doom Patrol–a prospect not everyone is happy with. But the team’s former leader hasn’t grown less manipulative in his old age, so nobody make any rash decisions. Pretty sure he’s up to something. Michael Allred (iZOMBIE, Silver Surfer) joins the team for this special issue. Prior to a few days ago I hadn’t ever read Doom Patrol. My first exposure to the series was Gerard Way’s run and I read Doom Patrol Vol 1: Brick by Brick front to back in a single sitting. I’ve read a lot of comics over the years and I’m not ashamed to say that it took me until issue five before I felt like I had a decent grasp on the story. I’m glad I made the decision to read the first story arc before jumping into this issue. I don’t think I would have appreciated what I had in front of me otherwise. The story here is complex and confusing, which is exactly what regular readers have come to expect from the series. Our favorite group of weirdos find themselves undertaking their first mission as a freshly reunited team. Along the way there’s a surprise resurgence of an old acquaintance who proclaims a desire to help, but may have shady ulterior motives. Strap yourselves in and prepare for travel across space time, aliens and new outfits! To call Doom Patrol unconventional is putting it lightly. This book isn’t for everyone–heck, it may not be for most people. It’s safe to say I had no idea what was going on during easily half of the story. Had I been completely new to this series, I would have had no idea what was going on for nearly the entirety of the issue. Thankfully I’ve read the prior six issues. So unless you’re okay with being lost at sea, you may want to consider picking up the first run. A quick first look at the pencil work from Michael Allred and I was telling myself “this isn’t for me.” That’s not to say Allred isn’t talented (he most certainly is), it’s simply not my typical flavor. I’m happy to report that by the end of the issue my position had flipped completely. Allred’s work fits perfectly with this story. There’s a very Sealab 2021 feel to his work, which my mind immediately equates to confusing hilarity. I can’t imagine how hard it was to follow Nick Derington, but Allred makes it look easy and delivers exactly what this story needs. The theme of “what the heck is going on here” has repeated itself in this issue, as I was lost for the vast majority of it. There’s something almost indescribably fun about the experience though. Despite the fact that you’re lost, being on the ride is so wacky and wild that you don’t want to get off. I found myself wondering more than once if Way could continue to one up himself on how weird his book is. Doom Patrol is quirky, strange, and downright confusing at times, but that’s okay because ultimately it’s such a fun story to experience. I can confidently say no one in comics is doing what DC is with the Young Animal imprint. If you’re looking for something different, look no further. Way’s presentation of Doom Patrol is wonderfully odd and truly unique. This is a great place to start with Way’s Young Animal collaboration, if you have the patience to work your way through it. Way's presentation of 'Doom Patrol' is wonderfully odd and truly unique.